The Gathering of the Lights is now open for booking. Would Lodge Magi and other attendees please contact Steven Critchley to confirm places. Director of Studies Dolores Ashcroft-Nowicki is beginning her Autumn workshop series, with weekends in the United States (Delaware, Seattle, and Philadelphia) as well as a workshop in London. Dear Friends and Family of the SOL. My Mother has asked me to write a few words about my book which went ” live ” on Amazon yesterday, and is ready to download from today, Monday 11th May 2015. 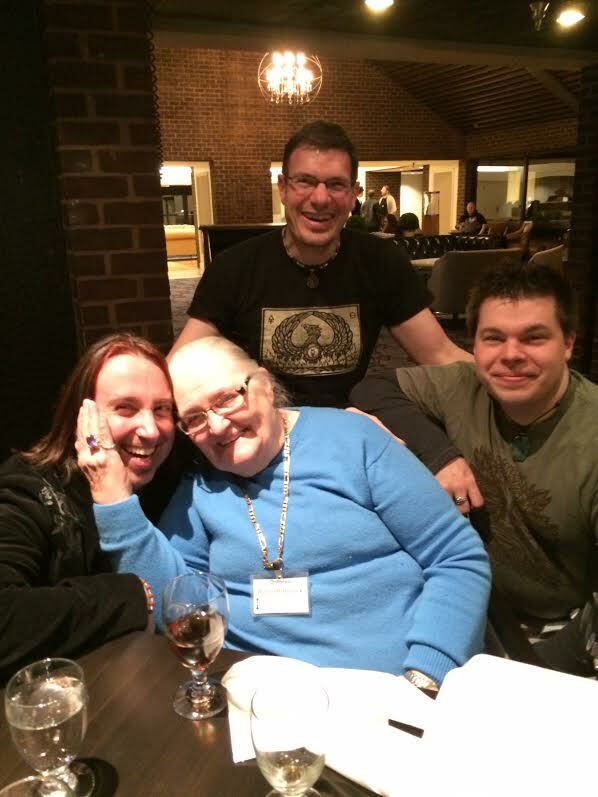 Dolores is pictured here with Christopher Penczack (left) Adam Sartwell (right) and Steve Kenson (above) – partner founders of The Temple of Witchcraft organisation, and sends her love from the Sacred Space / Between the Worlds conference in Baltimore. “It is with pleasure (and a sigh of relief) that I recommend this book of Heather’s writings, thoughts, and often deeply moving presentations of her personal journey on the Mystical path”. Dolores Ashcroft-Nowicki. Jersey, Jan 2014.